What makes the grades different? 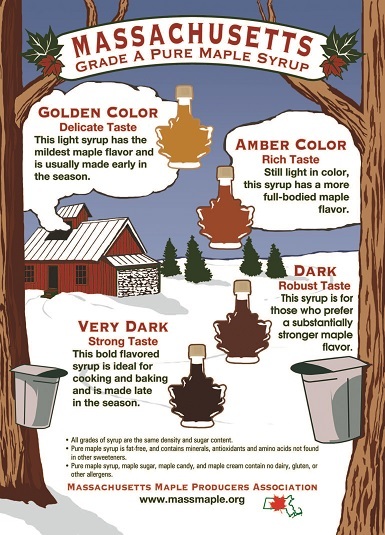 Pure maple syrup is graded according to Federal USDA regulations, and is based on both color and flavor. All syrup available to the public is Grade A, and then further classified by color. Golden Color, Delicate Taste. This light syrup has the mildest maple flavor and is usually made early in the season. Amber Color, Rich Taste. Still light in color, this syrup has a more full-bodied maple flavor. Dark, Robust Taste. This syrup is for those who prefer a substantially stronger maple flavor. Very Dark, Strong Taste. This bold flavored syrup is ideal for cooking and baking, and is made late in the season. All maple syrup grades are better than the artificial stuff. Otherwise it’s strictly a matter of personal choice. Ask yourself (or someone else) these questions: Which is better, white wine or red wine? Which is better, light beer or dark beer? Beer can probably be compared most easily to the different maple syrup grades/flavors. A light Pilsner beer has a light color and delicate flavor, while a Stout or Porter has a very dark color and strong flavor. It’s strictly a matter of personal choice, and there isn’t one grade of maple syrup that is “better” than another. What makes the different grades? Maple producers have no control over which grade they make. As a rule of thumb, lighter syrup is made earlier in the season, and darker syrup is made later. But since we are dealing with Mother Nature in our business, anything can happen. 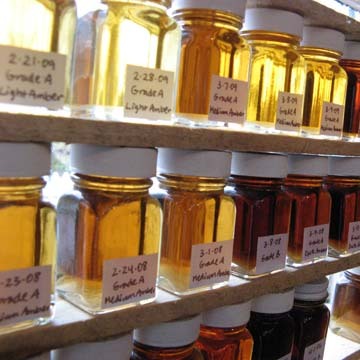 Producers have seen years where 95% of the annual crop was light amber syrup, and some years yield almost no light syrup at all, when most of the crop is dark syrup. During the six-week maple production season, the weather goes from cold to warm as spring pushes aside the cold of winter. Additionally, the trees themselves undergo metabolic and chemical changes as they go from winter dormancy to springtime activity. The tree buds start to form towards the end of the sugaring season, about a month before they open up into small leaves. These changes cause differences in maple syrup flavor as the season progresses. Experiment with the different grades, and continue to buy what you like the best. Remember: There is nothing better than pure maple syrup. 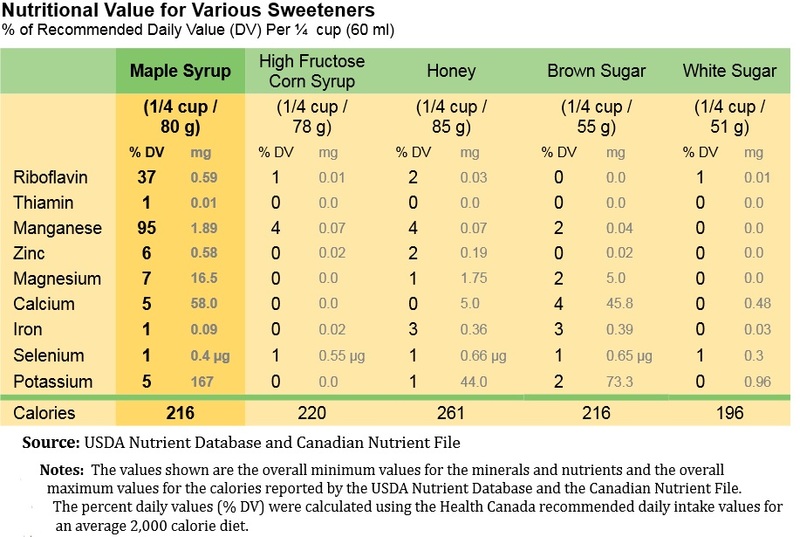 Comparison of nutritional values of maple syrup and other sweeteners. Antioxidants are man-made or natural substances that may prevent or delay some types of cell damage, strengthening your body’s ability to fight infection and disease. Pure maple syrup is a 100% natural food, processed by heat concentration of pure maple sap. This sap is a sterile, clear liquid, which provides the trees with water and nutrients prior to the buds and leaves opening in the spring. In the boiling, concentrating, and filtering processes, all the nutrients remain in the syrup. There are some quantitative differences in maple syrup’s nutritive composition due to metabolic and environmental differences among maple trees. Sugars: Sugars are an important source of energy. The main sugar in pure Maple syrup is sucrose. The darker grades, especially Grade B syrup, contain small and variable amounts of fructose and glucose. In order of sweetness, sucrose is less sweet than fructose, and sweeter than glucose. Minerals: Minerals have specific and nonspecific nutritional functions in the body’s metabolism. In pure filtered maple syrup the main minerals present are: calcium, potassium, manganese, magnesium, phosphorus, and iron. Amino Acids: Amino Acids are the building blocks of the proteins. In pure maple syrup many amino acids are present in trace amounts. Total Solids: The total solid’s in pure maple syrup amount to 66.5%, with the remaining 33.5% consisting of water. Additional information on the nutritional value of syrup can be found here and here.